Swedenborg has made it clear that the Bible story represents our inner spiritual growth process. Each character, couple, and tribe represents a different aspect of a person's spirit. 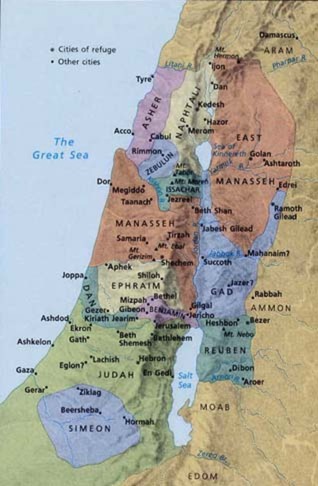 And each aspect of the biblical geography represents a different aspect of the inner person as well. All the different countries, rivers, mountains, and deserts in the Bible represent different aspects of our spiritual state. 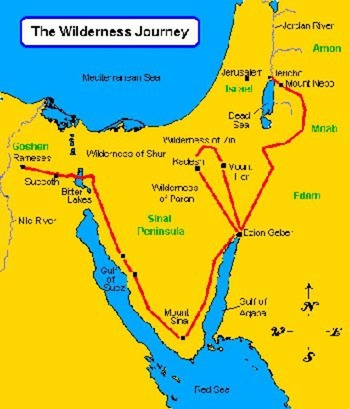 This week, we will examine the geographical landscape of the Holy Land and explore all that it represents in terms of the inner spiritual landscape. 1. Rev. Dr. George F. Dole "The Big Picture"
2. Rev. Lee Woofenden "The Hebrew Table of Nations"
1. Rev. Dr. William R. Woofenden "Caanan and Egypt"
2. Rev. Lee Woofenden"Israel, Assyria and Babylon"
1. Rev. Dr. George F. Dole "The North and the South"
2. Rev. F. Robert Tafel "The Jordan River"
1. Rev. Dr. Dorothea Harvey "Walking in the Land"
2. Rev. Dr. William R. Woofenden - "The Kingdom Period"
1. Rev. F. Robert Tafel "The Churches of Asia"
2. Rev. Ken Turley "Highs and Lows; Peaks and Valleys"
The growing complexity of the Israelites and their long journeys to and from Egpyt and eventual settling in the Holy Land "across the river" corresponds to the growing complexity of the human spirit and of our long journey of learning, maturing, and eventually coming to settle in a close and permanent relationship with the Lord. This week, using the Bible as our road map and Swedenborg's spiritual writings as our travel guide, we will explore that journey looking at the different dynamics and phases we pass through as we make our way along the inner journey from earth to heaven. 1. Rev. Dr. Willim Rev. Dr. William R. Woofenden "What's In A Name?" 2. Rev. Dr. George F. Dole "Samaria Revisited"
1. Rev. Ken Turley "Sojourning In Egypt"
2. Rev. Susannah Currie "Transformation in the Mountains"
1. Rev. George McCurdy Rev. George McCurdy "Spiritual Parallels and Contrasts are the Tipping Points"
2. Rev. Dr. George F. Dole "Conquest Strategy"
1. Rev. Lee Woofenden "Nuts and Bolts of Spiritual Health"
2. Rev. Dr. William R. Woofenden "Revelation: The Way the Divine Speaks to Us"
1.Rev. Susannah Curriee Rev. Susannah Currie - "Entering the Land of Canaan, the Promised Land Within"
2. Rev. Lee Woofenden "The Garden City: New Jerusalem"